In my family, Easter Sunday has always been a special time to gather around the kitchen table after celebrating the resurrection of Jesus at church. I can’t think of a better way to give praise than with a bounty of beautiful food. Whether you’re popping a spiral ham in the oven and pairing it with scalloped potatoes, or opting for a special mid-morning brunch after the Sunrise Service, I hope some of my favorite recipes will tempt your palate. 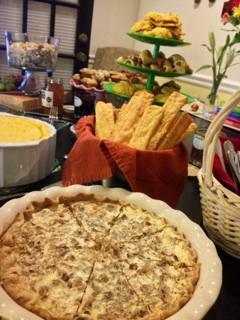 I’ll share three that are menu must-haves including Vidalia Onion Quiche, Best Grape Salad and Spicy Cheddar Long Straws. Choose one, or make them all. Happy Easter, y’all! Preheat oven to 450 degrees F. Fry the bacon in a medium skillet until it is very crispy. Remove the bacon to a paper towel to drain. Drain off all but one tablespoon of the bacon grease. Saute the onion in the grease until it is very tender and just beginning to turn brown, about 10 to 12 minutes. Stir in the flour.In a quart measuring cup, measure the half-and-half. Add the eggs and whisk together. Add the salt, pepper, and thyme. Place the pie crust in a deep-dish glass pie dish. Crimp the edges. Prick the bottom and sides of the crust. Layer both cheeses in the bottom of the crust. Distribute the bacon pieces and sautéed onion over the cheese. Pour the egg mixture over all. Place the pie dish on a cookie sheet for ease in handling and put in the center of heated oven. Bake for 10 minutes at 425 degrees, then reduce the temperature to 350 degrees and bake for 45 minutes longer or until the center of the quiche is set. You may need to cover the outer edge of the crust with foil to prevent over-browning. Who doesn’t love cream cheese and graham crackers? Beware–the cold and juicy grapes in this crowd-pleaser are addictive. Thanks to my Aunt Susan for introducing me to such a fabulous recipe! Wash and stem grapes. Set aside. Mix sour cream, cream cheese, white sugar and vanilla by hand until blended. 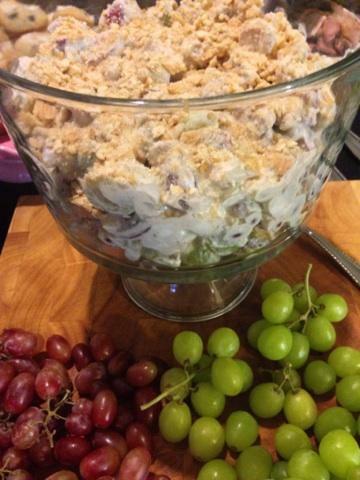 Stir grapes into mixture, and pour in large serving bowl. 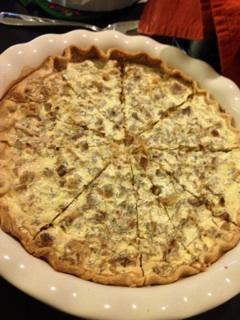 For topping: Combine brown sugar, and crushed pecans. Sprinkle over top of grapes to cover completely. Chill overnight. I can testify to that! 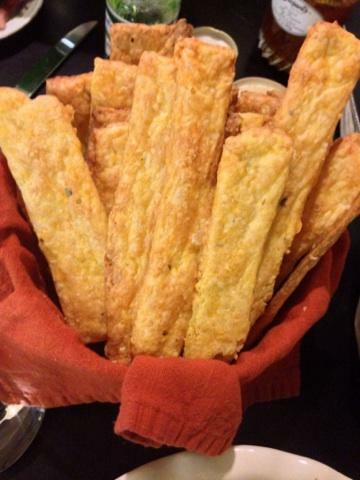 These cheese straws have become one of my go-to snacks for entertaining any time of the year. I think they’re especially great at brunch with a Bloody Maria. Their buttery texture crumbles and melts right in your mouth. Preheat oven to 350°. Prepare dough, and turn out onto a well-floured surface; divide in half. Roll each half into a 12- x 8-inch rectangle (about 1/8 inch thick). Cut dough into 3/4-inch-wide strips using a sharp knife or fluted pastry wheel, dipping knife in flour after each cut to ensure clean cuts. Place strips on parchment paper-lined baking sheets. Bake 18 to 20 minutes or until edges are well browned; cool on baking sheets on wire racks 30 minutes. For more brunch inspiration, check out these photos (provided & styled by The Stylish Steed) from a brunch party I hosted at home. Some Kinda Good, good food and good company, that’s what it’s all about! What are your favorite springtime dishes?